Google's Android has slipped past Apple's iOS to become the top mobile operating system for the first time, in terms of online usage. Figures from Net Marketshare show that devices powered by Android were detected browsing the web more than iPhones, iPads, and iPod Touch devices running iOS throughout July 2014. Net Marketshare says it gets its usage stats by monitoring a network of websites worldwide that serve about 160 million page views a month. The latest mobile OS usage number is particularly striking since Android is already so dominant in terms of devices: it runs on 85 per cent of handsets sold compared with iOS just 11.9 per cent. It seems fanbois are apparently much more active as users. But it seems the sluggish fandroids are starting to perk up: Android usage grew from 43.75 per cent in June to 44.62 per cent in July, while iOS usage dipped from 45.61 per cent 44.19 per cent. 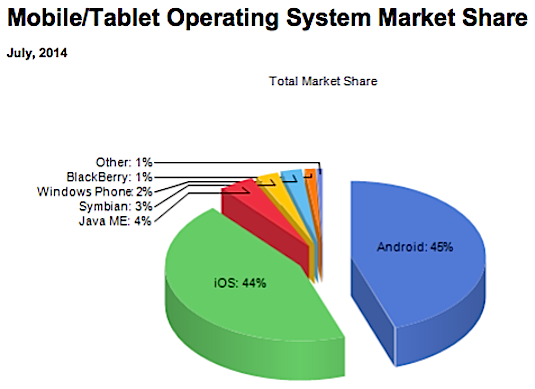 Coming in a third place after iOS and Android is Java ME, which provided 4.19 per cent of mobile and tablet web access in July, followed by Nokia's Symbian mobile operating system, which brought in a tiny 2.57 per cent.